We have come up with a wide range of Plastic Blow Molding Machinery like Blow Molding Plant, Plastic Jerry Can Plant etc. Our Blow Molding Plants are playing an active role in various industrial applications. Manufactured as per industry norms and standards, our blow molding plants are designed in accordance to the varied requirements of clients. 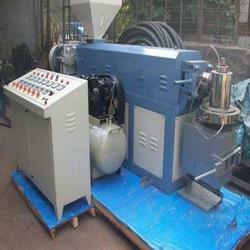 We offer blow molding plants in different customized specifications to meet the bulk needs of clients. We are involved in offering high-quality Plastic Blow Molding Plant to our valuable customers. The products offered by us are manufactured following industry laid standards. These plants are available in standard, vented and High L/D Ratio version and having screw & barrel made out from alloy steel & fully nit riding and hard plating.